Newcastle United's season is in danger of totally collapsing following last night’s 4-0 home defeat to Tottenham. An almost empty St James’ Park told its own story at the final whistle. 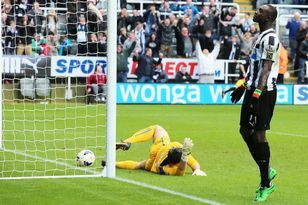 Newcastle have now lost five consecutive home matches, four in the Premier League, and this was one of the meekest performances of the entire season. Emmanuel Adebayor scored twice, plus Paulinho and Nacer Chadli did the damage for Tim Sherwood’s side who in truth looked a league apart from United. Papiss Cisse was given his first league start in five months alongside Luuk de Jong, but they failed to score what would have been the first United goal in four games. Manager Alan Pardew is now under serious pressure. This is the first time in Premier League history that Newcastle have lost four home matches in succession. Coming on the back of Pardew’s third derby defeat on the bounce, he is beginning to clock up some unwanted records. As the only public face of the football club the manager must try to explain why so little was allowed to happen in terms of transfers. His squad now looks demoralised and decimated going into the final dozen matches of a once promising season. Once again there was a lack of guile in midfield as the visitors coasted to victory.